For Canadians west of Ontario, this drama is a must see. 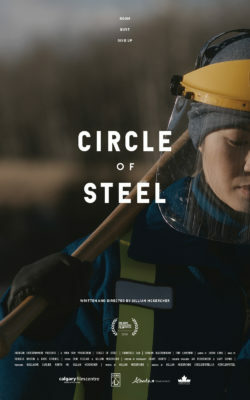 Circle of Steel, directed by Gillian McKercher depicts life in the oil and gas industry so accurately. Granted, I haven’t worked a day in the oilfield, but the pacing of McKercher’s eye walking the audience through the every day creates real tension. It’s a fictional drama that reads like a tense documentary. The story follows a chemical engineer new to Paloma North amidst the height of the 2015 oil and gas crash. Wendy Fong is portrayed brilliantly by Chantelle Han who brings serious life to the fictional woman facing some desperate circumstances. This film also has slight feminist overtones to it, placing Fong at the centre of depression, loneliness and staring down the barrel of an uncertain future. McKercher’s choice to show with pinpoint accuracy the long days and lonely nights following a monotonous routine creates a world-shattering feel as the film walks towards more immediate and real decisions. Circle of Steel speaks to the dilemma of ethics in Canada’s arguably-most unethical industry: big oil.